NRFit™ Connectors and Caps meet ISO 80369-6 standard. 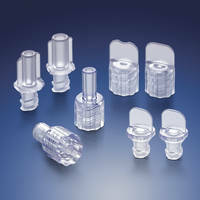 Designed for neuraxial applications such as spinal and epidural procedures, NRFit™ Connectors and Caps are BPA and latex-free medical-grade acrylic resin. Connectors are available to fit 0.083 in. or 0.122 in. outer diameter tubing whereas caps come with vented and non-vented designs. Suitable for small-bore connecting applications, connectors feature ergonomic wings on the female connectors and the easy-to-grip hub on the male connectors. Qosina has added eight new NRFit™ connectors and caps (#40050-#40057) to its product line. These components are compliant with the ISO 80369-6 standard, which specifies the requirements for small-bore connectors to be used for connections in neuraxial applications such as spinal and epidural procedures. The NRFit™ connectors look much like luers, making a tapered seal connection; however, they are slightly smaller so that they cannot be misconnected to male or female luers as specified in the ISO 594 standards. The NRFit™ components are BPA- and latex-free medical-grade acrylic resin, small and lightweight, gamma and EtO sterilization ready, and are clear with no colorants added. The connectors are available to fit 0.083 inch (2.1 mm) or 0.122 inch (3.1 mm) outer diameter tubing, and the caps are offered in both vented and non-vented designs. The ergonomic wings on the female connectors and the easy-to-grip hub on the male connectors allow for ease of use. Qosina offers low minimums and short lead times. Log on to qosina.com to see pricing, obtain our latest catalog, request complimentary samples and place orders. Be sure to sign up for our monthly e-newsletter to stay current with our newest product additions. Our product development team can work to customize a part to your specifications. Call our customer service specialists to discuss your project in detail via phone +1(631) 242-3000 or email info@qosina.com. Founded in 1980, Qosina is a worldwide supplier of thousands of stock OEM components including bioprocessing accessories, compression fittings, ENFit™ connectors, NRFit™ connectors and caps, luers, clamps, clips, check valves, stopcocks, hemostasis valves, tuohy borst adapters, swabs, spikes, syringes and tubing to the medical and pharmaceutical industries. Qosina is based in Ronkonkoma, NY in a 95,000 square-foot facility with an ISO Class 8 Clean Room and is ISO 9001, ISO 13485 and ISO 14001 registered. Qosina also is a member of the Global Enteral Device Suppliers Association (GEDSA). Plastic Lid covers 200# and 420# propane cylinders. Single-Piece HDPE Closure fosters PCO 1881 standard conversion. Bump Cap is tested and compliant to EN 812: 2012. Protective Pipe Caps for shipping and storage.